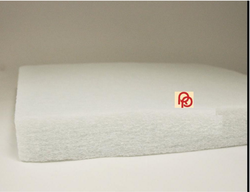 We Offer a comprehensive range of thermally bonded polyester fibre wadding. These have been developed for use across various applications associated with the manufacturer of upholstered furniture, mattresses, bedding and clothing. The polyester wadding’s are supplied in weights ranging from 50gm/sqm – 2,600gm/sqm and are offered in roll form to suit customers requirements. Maximum Width can be 3.25 mtr. Length of each roll can be customized as per customer's requirement. RP Polyester Wadding is a layer of insulation used in quilting between a top layer of the upholstery ticking and a bottom layer of the backing material. Our Thermo bonded polyester wadding has some unique features that include right weight/volume ratio for styling and designing, exceptional dimension and volume stability and fiber uniformity. Our products are specially designed to give comfort and warmth, easy to handle and environment-friendly. Applications: Clothing and upholstery such as sleeping bags, jackets, quilts, furnishings etc.